Click Reference to check more supported devices or formats. An ideal tool to backup iPad files, convert and transfer multimedia files to iPad in a convenient way. With fast transferring speed, 4Media iPad Max Platinum helps you to backup iPad music/movies/photos/books/ringtones/SMS/contacts to computer or iTunes, and transfer files from local machine to iPad. The versatile conversion engine lets you to convert audios/videos in popular formats to iPad compatible music/movies; the advanced CD/DVD decryption utility can transfer any CD/DVD to iPad; powerful video downloader and converter can grasp online videos from popular video broadcasting websites; great video/audio clipping function enables you to create customized iPhone ringtones and so on. Support connecting multiple devices simultaneously, you can easily transfer files even applications between different devices including all iPad/iPod/iPhone models. Propelled by NVIDIA GPU acceleration technology, 4Media iPad Max Platinum can give you the fastest transfer speed and the best conversion experience. With this ultimate iPad manager, iPad management wouldn't be so easier ever! Back up music, movies, pictures, SMS messages (html and text format), contacts, books (PDF and EPUB formats), ringtones, photos shot by the device in iPad to PC or iTunes, easy and fast. Transfer compatible multimedia files into iPad from PC easily and handily like iTunes does. The advanced CD/DVD decryption utility can transfer any CD/DVD music/movies to enjoy on iPad, you can also convert ISO image file or IFO folder to audio/video files compatible with iPad. 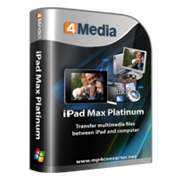 A powerful video downloader and converter, 4Media iPad Max Platinum can grasp online videos from popular video broadcasting websites and convert and move in one-step to the devices directly. This program also owns great video/audio clipping functions to create customized iPhone ringtones and transfer to iPhone instantly. Transfer application between PC and iPad, also support to manage some applications' documents. Drag and drop makes it easier to operate. Fully support all iPad/iPod/iPhone models: iPad, iPad 2, iPad 3, iPad 4, iPad mini, iPad mini 2, iPad mini 3, iPad mini 4, iPad Air, iPad Air 2, iPad Pro (12.9/9.7/10.5 inch), iPod, nano (5th Gen), iPod mini, iPod shuffle, iPod classic, iPod touch, iPod touch 4, iPod touch 5, iPod touch 6, iPhone, iPhone 3G/3GS, iPhone 4, iPhone 5/5S/5C/SE, iPhone 6/6 Plus, iPhone 6S/6S Plus, iPhone 7/7 Plus, iPhone 8/8 Plus, iPhone X, iPhone XS, iPhone XS Max, iPhone XR. Support iOS 12 and iTunes 12 as well. Support browse and logon the most popular online broadcasting websites within the application, including YouTube, Metacafe, Dailymotion, Break, Vimeo, Revver, Blip, Vidilife and Stickam to download and convert online videos in one click. Engined with NVIDIA GPU acceleration technology, the transferring, downloading the converting processes are accelerated to the fastest speed. Support connecting multiple devices simultaneously to complete file transferring between them without limitation. You can sync your data via Wi-Fi. Create, edit or delete iPad/iPod/iPhone playlists and photo albums with ease; classify files by genre, artist and album. More than iTunes, with it, you can copy photos from photostream and import contacts from Address Book programs like incredimail. 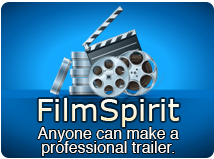 Provide a convenient built-in web browser to logon and view online video websites and the embedded media player to preview DVD movies, videos and photos. Automatically select the optimized profiles when exporting files for different devices. Proxy server configuration is provided to configure your network in HTTP or SOCKS 5 type. System Power Management Options prevents standby/hibernation when connecting to mains or using battery. Search your collection by Album List View, Artist list view, Genres list view or Composers list view. You'll quickly find exactly what you want. View your music playlist in Thumbnail view. You can put any image as a thumbnail. Apply the image to whole genera or album or playlist. Check a song and see which playlists it's already on and see all of the playlists the song belongs to. English, German, Spanish, Italian, French, Japanese, Simplified and Traditional Chinese interface languages are available. Fully compatible with iOS 7, iPhone 5s, iPhone 5c, iPad Air. Fully compatible with iPhone 5, iPad 4, iPad mini, iPod touch 5, iPod nano 7, iOS 6.1, iTunes 11.0. Strengthened the function of playlist management. Added the function of copying photos from photostream to computer. Provided support for importing contacts exported from Incredimail. Added the function of dragging and dropping apps. Fixed the bug of failing to show artworks of music files.